Most of the times we find very interesting sites and free stuffs on the internet like e books , games , music etc. , but as there is nothing as a free lunch , we need to provide your email address to these websites to receive the free stuffs in our mail . Most of these sites are not trustworthy . and the main intention behind giving away free stuffs is just an method of harvesting email address of peoples . Sooner or later you will notice that your email address will start receiving a lot of spam messages . The same problem is with many sites and forums that require you to register with your email address to be able to access their sites . You don’t know which one of these sites may end up using your email id to send spam into your mail . There is a easy solution to this problem . you can use one of the many free online service which to create a temporary and disposable email address . which can be used to register with these sites to access them or get free stuffs . lets check out a very useful disposable email service called 10minutemail , which will help us to solve the problem of spam . As the name suggests , 10minutemail is a free online service for creating temporary disposable emails which stay active for a period of 10 minutes . In case you need more than 10 minutes , 10minutemail allows you to extend your disposable mails time period by another ten minutes . You can use this site to register with any site that you feel is not trustworthy enough to provide your email address with . Since most forums and sites have an one time registration and verification process . you can create and use a disposable email from 10minutemail to register with these sites and complete the verification process . 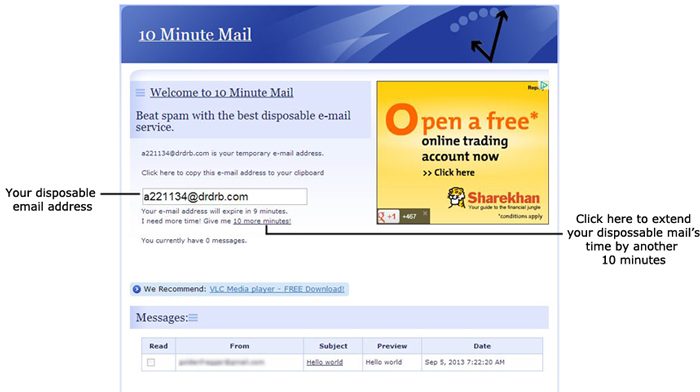 Theres only one demerit of 10minutemail , which is you cannot use this service to send mails from your temporary email address . you can only receive any email or attachments through this service . Probably in order to stop people from sending spam or fake emails . Now lets see how can we use 10minutemail . Step 3: Register with any site with the disposable email address provided to you. Step 4: your inbox will update automatically when a new mail arrives or you can refresh it manually . Step 5: If you want to extend the time period of your email address , click on the “ I need more time! Give me 10 more minutes! “ as shown below in the picture . Tryout 10minutemail and lets us know of any similar sites you use . In our next post well will provide you with a list of many other websites offering disposable mail services .